Amazon provides a number of services (free and paid) that may be of interest to the application developer. Here we are specifically interested in utilizing the Simple Email Service from within Survey Solutions for mass email sending. Usage of this service may cost you money. Make sure you understand all charges, limits and policies before utilizing this service. If you are already an Amazon AWS user, you can login to your Management Console right away. Otherwise you will need to create a new AWS account. A valid credit card is required to create this account. Amazon plans and regulations determine when, how and how much you will be charged for these services. The below instructions are applicable to personal accounts. Your organization may have a corporate or other kind of account with preferential treatment, different billing arrangements, or simplified configuration process. Once a new account is created login to the Management Console. Select Services->Customer Engagement->SES. Verify the address that you will be using for sending out the messages. This is done by clicking the link that you receive from the Amazon Web Services no-reply-aws@amazon.com. Next, utilize the Add user wizard to create a new user and assign this user appropriate permissions, group membership and policies. Once the user is created, proceed to Security Credentials and Create Access Key. You will be issued an Access Key and you will obtain the secret as a downloadable file. You have only one chance to preserve this pair (though you can issue another Key+Secret pair later). If you’ve just created your AWS account it is likely in the sandbox mode and it will only permit you to send the notifications to the emails that you yourself have confirmed. 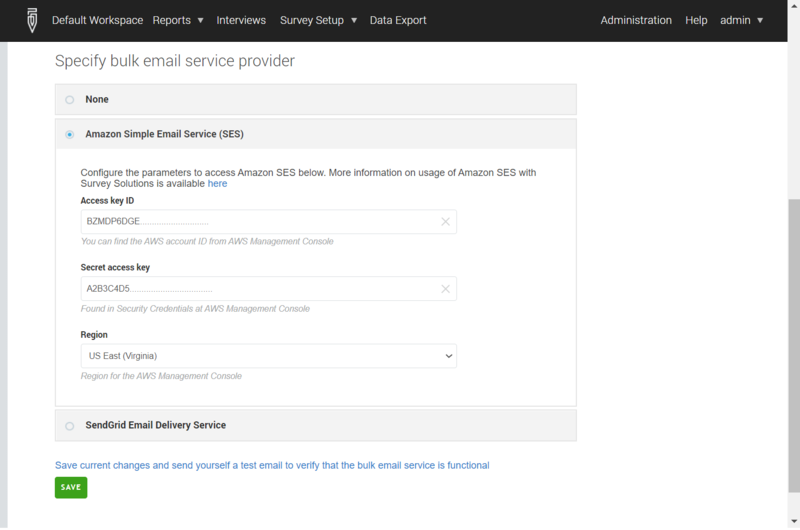 To reach real survey respondents you will need to Request Increased Sending Limits, where you submit (to Amazon) the information about your intents. When you fill out this form for region pick specifically “Northern Virginia”. On the basis of the information you provide you will be assigned various limits on number of emails that may be sent per second, per 24-hour period and per month. Depending on the limit, email requests above those limits may cost more or be disregarded. The approval of the request is not instanteneous, and may take days. Plan your operations accordingly.